NBA (NI) announces three-day Beef Expo tour themed ‘Beef Up Our Future’! The National Beef Association (NI) has today launched the details of its annual three-day road trip to the NBA Beef Expo. Hosted in Shropshire this year the tour will run from Wednesday 23rd to Friday 25th May and will include two days of farm tours visiting four exceptional farms across Shropshire and the welsh borders, two nights’ accommodation, the Beef Expo Industry Dinner, entry to the prestigious Beef Expo held at Shrewsbury Auction Mart and all transport. After travelling from Dublin to Holyhead, the farm tours will kick off with a visit to Moor Farm and Shop, A fantastic example of a modern family business which has diversified in more ways than one and created a niche market for their award winning herd of Hereford Cattle. Moor Farm is a not so traditional mixed farm based in Baschurch, Shrewsbury, home to Mike and Hazel Timmis and their daughter’s families and the Shraden Hereford herd. Established in 1919, the herd which will be celebrating its 100th year in 2019 now consists of around 170 including 65 breeding cows. The farm steading was originally located in the village but in 2006 the family made the decision to move the farmhouse and farm buildings to the edge of the village to give them the opportunity to improve access and build modern buildings tailor-made for farming efficiently. Sisters Mallissa, Emma and Elaine and their partners have since entered the family business, setting up Moor Farm Shop and café, as well as a polo pitch, grain dryer and lab. The herd currently achieving 95% of calves reared from cows put to the bull with longevity at an average of 11 calf crops. 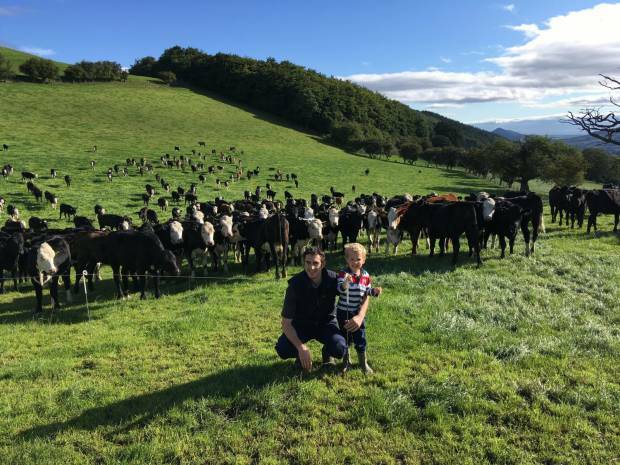 The family aim to rear bulls to a target finishing weight of 700kg LW in 14 months and heifers to 550kg LW in 18 months. Selection of herd replacements and bulls is 50:50 on visual analysis and Breedplan performance data including EBVS for carcass traits such as eye muscle area and retail meat yield, vital for their market. This tour will include a delicious meal, including Hereford Beef produced on the farm. James Evans’ Partridge Farm spans just over 800 hectares and is home to his 300 Stabiliser performance recorded suckler cows and 1,000 Lleyn ewes. The sucklers are split into two units, a 180-cow spring-calving herd and a 120-cow autumn-calving herd both producing quality maternal high health status breeding stock and bulls finished in a semi intensive system. Trefnant Hall farm is the second farm tour. A 500-acre tenanted farm on the Powis Estate, run by Marc Jones in partnership with his parents David and Jane. The farm runs 800 Lleyn and Romney ewes which lamb outside and 300 Angus and Hereford calves which are reared on grass and outwintered on forage crops through to 20-24 months at approx. 250-320kg DW. A further 450 calves a year are contract reared. The farm now aims to produce 1 tonne of live weight per hectare and profit which is three times the single farm payment. Jonny Cornes is the final farmer to welcome visitors to his exemplary mixed farm just outside Shrewsbury. Here, he finishes approx. 1800 store cattle and 15,000 store lambs. Cattle are bought in from local markets, vaccinated on arrival, housed in straw yards and fed on home grown grain and forage. Muck is then utilised on the 1000 acres of arable ground. The trip will finish with a day at the NBA's annual Beef Expo. This year’s event will include the NBA National Commercial Cattle Show, breed societies, educational and trade stands, demonstrations, seminars, the South Devons’ Technical Show and a Beef Farmer Competition with some great prizes up for grabs! With something for everyone the event acts as a key networking opportunity for everyone with an interest in the beef industry and showcases the Best of British Beef. The tour is priced at £224 plus VAT for NBA members and £240 plus VAT for non-members. With only 90 places available on this prestigious tour be sure to book fast to avoid disappointment (Deadline Friday 4th May).